During the 2016 U.S. presidential campaign Republican candidate Donald Trump repeatedly claimed that he would accept the election results as legitimate, but only “if I win.” While many downplayed this as hyperbolic campaign rhetoric, it was a shocking statement coming from a major party presidential candidate. One of the core features of a strong democratic political system is the acceptance of the results by the losing candidates as legitimate. Since his election, President Trump and his administration have continued to make a variety of statements and actions that have challenged, weakened, or ignored democratic norms and institutions in the United States and around the world. This has not taken place in a vacuum. The number of democratic regimes throughout the west has been declining over this past decade. Many of those that remain have been weakened by the election of authoritarian-minded populists who have sought to consolidate power and destabilize democratic norms and procedures in their respective countries. 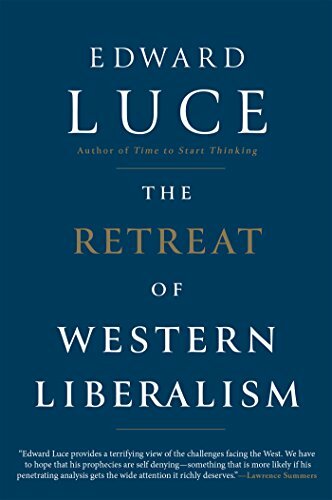 In The Retreat of Western Liberalism, renowned journalist Edward Luce seeks to explain the causes and consequences of the recent decline of the number and strength of democratic regimes around the world. In a nutshell, his basic account goes something like this: middle-class economic stagnation over the last several decades has led to a disillusioned working class that resents the growing inequality of social and economic capital in western societies. Leftist political parties (including the Democrats in the U.S. and Labour in the U.K.) have reacted to this resentment with smug tone deafness. The working class has hit back by electing populist illiberal autocrats like Donald Trump or voting for nationalist ballot initiatives like Brexit. Throughout the book, Luce does a masterful job of describing the contours of the rise of illiberal democracy in the west. The explanation that he offers for this phenomenon, however, is less compelling. There are several difficulties with this line of argumentation. First, it fails to acknowledge the nuanced ways in which racial attitudes can manifest themselves among voters. While Luce is right that outright bigots are a minority in any society, he overlooks that racial resentment and implicit racial bias remain prevalent. Public opinion surveys have regularly shown, for example, that a majority of voters who support right-wing populist candidates like Donald Trump agree with statements like: “It’s really a matter of not trying hard enough; if blacks would only try harder they could be just as well off as whites.” This is not blatant racism, but more a more subtle form of prejudice that racial minorities receive unfair and unearned advantages. Numerous studies have shown attitudes like these to be strong predictors of support for populist candidates, even stronger than economic anxiety or working class status. Further, political scientists have shown based on exit polls and public opinion survey data that Trump voters, both in the primaries and general election, were not predominantly the “white working class” often identified by political pundits and politicians. Rather, Trump drew more support from upper-middle-class and upper-class conservatives. These are not “left behinds” of globalization and economic stagnation, but those who fear losing their place of demographic and economic privilege in a rapidly changing society. Finally, it is not persuasive to pin the blame for the appeal of illiberal populism squarely on the smugness of liberal elites. True, it is not a stretch to argue that liberals have a smugness problem and do a poor job of connecting with large swaths of the population outside of cities and urban areas. That said, conservatives are ultimately responsible for the nomination and election of a candidate like Donald Trump who gave every signal in the campaign that he was a racist, misogynist, confessed sexual assaulter with little regard for democratic norms and institutions. There were other choices at each level of the process, and they still ultimately decided to choose him. The smugness of liberal elites, no matter how infuriating it can be to some, is still a poor excuse for the election of an authoritarian autocrat who is actively weakening democratic institutions at home and abroad. While the diagnosis of the decline of Western liberal democracy is somewhat unpersuasive, the Luce’s predictions about the potential consequences are more compelling. According to this book, a clear result will be the weakening of the moral standing and influence of the U.S. and Europe around the world. As a result, global power is likely to shift from the west to the east (Russia, China, India, etc.). To illustrate this prediction, Luce includes a detailed fictitious account of the “U.S.-China war of 2020” in which Trump’s inexperience and “America First” policies spark a trade war which quickly escalates into a military conflict over Taiwanese independence. As the only major world leader trusted by both American and Chinese leaders, Russian President Vladimir Putin comes to the rescue, brokering a ceasefire between the U.S. and China while (presumably) boosting his own reputation and stature in the global community. While of course only a hypothetical narrative, it serves to illustrate the stark potential consequences of electing authoritarian populists like Donald Trump: the weakening of the ability of the U.S. and other Western democracies to be a force (however imperfect) for freedom and human rights around the world while strengthening the influence of authoritarian regimes in Russia and China. It is up to us to decide whether we care enough to do anything about it. Benjamin Knoll is John Marshall Harlan Associate Professor of Politics at Centre College in Kentucky.